Click click-itty click clack ... snap. The loud noises and snapping thread are ominous. And perhaps inevitable. The poor sewing machine has never had a grease and oil change. I try a new needle. Then a different bobbin. Finally I acquiesce and get the screwdriver. Presser foot: off. Shank: off. Throat plate: off. Wow ... look at all that felt. Oops, that's not felt. Out with the lint. Better take a few more bits out - its looking ugly in there. Two screws in the dogwhatsits unscrewed and out. What's this screw for? Hmmm, its stuck. Can't go any further. Give up. I have no idea what I am doing. I'll just pop this screw ... arrrrggh. How did I drop that? Right inside the bowels of the machine. So let's stop right there. What would you do at this point? Would you pick up your machine and give it a jolly good shake, imagining this would magically dislodge the screw? Would you tip the machine upside down, hoping said screw would fall out? You're right: what kind of imbecile would do that? Perhaps the kind who would might go on to frantically undo screws that scream "warranty void if removed". Or who might attempt to jemmy open the side of their (computerised) sewing machine. Clearly the kind of imbecile who might think well, this is already going to be expensive, what have I possibly got to lose? Now if you could excuse me, I must go and consult the Yellow Pages. With you all the way !!! Oops! Sounds expensive. It's the sort of daft thing I'd do (accompanied by lots of swearing). Hope it's easily fixable and that you don't have to take out a second mortgage or sell your children to afford it. My kids have all these magnet sets with long bits. Could you get a screw out with one of those? I hope the solution is quick and cheap.. The magnet idea has merit! Camberwell sewing centre is pretty good, and they might give you a service discount because it's already disassembled?!? Oh noooo! Well, I'd be the one turning the machine on its ear trying to shake the screw loose. :P Best of luck! Oh no! My fella bought himself a torch that has a telescopic magnet stick thingy that comes out of the centre of it for when he works on his car and drops screws in the engine bay and can't reach them. As soon as I saw it I begged for one of my own for when I'm sewing and drop pins and needles onto the floor and can't find them again. Sorry about the rambling but... Maybe something like this will get it out? I think you can get them Supercheap Auto? Good luck!!! Been there done that...the whole shaking the machine upside down, the bugger was heavy!! Would suggest that a magnet near a computerised sewing machine is a sure way of wiping all memory off machine and therefore not the best idea. Hope you find a cheap solution without too much delay, you were obviously in the middle of doing something. I would have tipped it upside-down. But I don't go near computerised sewing machines in the first place! I hope you find your screw. Are you sure it's inside your machine? We managed to find a dropped overlocker screw yesterday by crawling around on the floor with a magnetic pincushion. If you are scared to put a magnet inside your machine, you could use some double sided tape (or inside out) on a stick? Maybe you could brush it out? Hahahahahahaha - you have a screw loose. Liesl, step away from the machine. Put all the little bits into a zip lock bag. Phone the sewing machine shop. Seriously, step away now!!! Put it all back together and don't say a thing and just book it in for a service (not a repair)... and see if you can get out of it cheap! No, I would never have done that. Never. Reason? I am more sensible? I know better? Nope, I couldn't lift my sewing machine to turn it upside down and shake it! So kudos on the muscle power. I think Curlypops is onto something. reassemble. Explain that since you lent your machine to your sister (that would be as in Evil Twin) it doesn't work properly and could they please give it a service. Or blame it on the children. Oh! Oh, no! AND Yikes! Cam is right. Don't go into too much detail. My repairman tends to laugh raucously, calls over his partner and repeats the story while I am still present. Hard to walk out with one's dignity intact in those circumstances. Good luck with that. Perhaps a little tute on care of sewing machines might fill in the time until it comes back home. Lisa. Oh crap. That doesn't sound good. Good luck! I like your style HB. That's exactly the kind of thing I'd do. And while I was shaking it, I'd give it a bloody good talking to as well. Hope you can get it fixed without too much expense. I'm just seriously impressed that you knew that thing was called a 'throat plate'. And considering putting a spoon in my mixmaster beaters while they were going ("I'm a good cook, I can just wipe the back of the spoon off, like this... oh no") has cost me the grand total of $281 (!!!!!) I am wishing you luck on the repair front. Fellow imbecile here.... I work on the principal that if the screwdiver fits the screw then it's there to be removed. Have you thought of applying suction ? Sounds daft, but if you put the leg of a pair of tights over the nozzle of your hoover and point in the right direction all sorts of amazing things come out. NOTE.. DON'T DO THIS WITHOUT THE TIGHTS OR YOU WILL NEVER SEE IT AGAIN. Is that a bad sign??? Eep! That looks scary...and exactly like what I would have done. 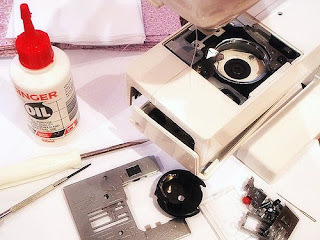 Time to start batting those eyelids at the nice sewing machine repairman and hope for the best? Can't help but laugh in a bitter, twisted sort of way. I thought that I dropped a needle into the depths of my brand new, expensive embroidery machine a while back but couldn't find that darn thing to save myself. So proceeded to go ahead and use it...until the smart-a&#e thing TOLD me in no uncertain terms (ie words on the computer screen) that there was something really wrong with my machine and I shouldn't been using it. Well worth the money I paid that it is smart enough to tell me that! From a deep, dark echo-ey hole somewhere near the centre of the earth...AAAAARRRRRRRRGGGGHHHHHHHH! Oh man! That sort of scenario is totally why I put up with Mister Fixit's snoring. My daytime coworkers don't understand why this is so dang funny! This was me last week, by the way, although without the phone call to the local sew'n'vac. What is coach bags?Do you know coach bags outlet?Buy these coach bags outlet store.More cheap coach bags on sale! !Always be copied,never be transcended.gucci handbags looklike a wonder.Please dicount gucci bags for yourself.gucci handbags outlet is your best friend.gucci outlet sale well.